Bette Davis, John Garfield ,The Andrews Sisters, Jack Benny, Joe E. Brown, Eddie Cantor, Kitty Carlisle, Jack Carson, Joan Crawford, Helmut Dantine, Faye Emerson, Sydney Greenstreet, Alan Hale, Sr., Paul Henreid, Joan Leslie, Peter Lorre, Ida Lupino, Dorothy Malone, Dennis Morgan, Janis Paige, Eleanor Parker, Roy Rogers (with Trigger), S.Z. Sakall, Zachary Scott, Alexis Smith, Barbara Stanwyck, Jane Wyman, Jimmy Dorsey, Donald Woods, Andrea King, Joyce Reynolds and The Golden Gate Quartet. Slim Green (Hutton) is fighting in the Pacific and dreaming of actress Joan Leslie. When he is injured and sent home-he and his buddy Sgt. Nowland (Clark) drop by the Hollywood Canteen. Slim asks film stars Jack Carson and Jane Wyman if Leslie will be at the Canteen that night. Real life creators of the canteen Bette Davis and John Garfield arrange for Leslie to come to the club that night and arrange for the two to meet. Slim and Leslie later win a date together and a romance between the two develops-including Slim meeting her family. The film is peppered with musical numbers and cameos, similar to “Stage Door Canteen,” but may have more of a plot. Slim (Hutton) receives a kiss from his actress crush Joan Leslie at the Hollywood Canteen. -The soldiers watch a film in the Pacific starring Joan Leslie. The film is “The Hard Way” (1943) also starring Ida Lupino, Jack Carson and Dennis Morgan. -Ann Sheridan was originally supposed to play the role of the actress. However, Sheridan turned down the role because she said it wasn’t realistic for an actress to fall in love with a soldier. -During the filming of “Hollywood Canteen,” Bette Davis was filming a dramatic film and had a hard time playing herself, said Joan Leslie. “She was having trouble concentrating…At one point she said, ‘Oh cut! This is terrible. I can’t play myself. I don’t know how…But if you give me a drink, cigarette and a gun, I’ll play anything you want me to!,” Leslie said in the book “Movies Were Always Magical ” by Leo Verswijver. -The movie was supposed to originally be a multi-studio film including stars from Twentieth Century Fox, MGM and Paramount, since these celebrities appeared at the club. When studio heads balked, Jack Warner kept just his own studio players in the films. -Betty Brodel, who is Joan Leslie’s sister in the film, is Leslie’s real-life sister. -The real Hollywood Canteen was located at Cahuenga Blvd. near Sunset Blvd. -Joan Crawford’s first film after leaving her contract with MGM. -Profits of the film were donated to the War Effort. Nominated for an Academy Award for Best Song “Sweet Dreams, Sweetheart.” Also nominated for Scoring of a Musical Picture and Best Sound Recording. -Robert Hutton sees Barbara Stanwyck and he says, “You’re Barbara Stanwyck.” Stanwyck says “How can you tell?” Their scene together is adorable. 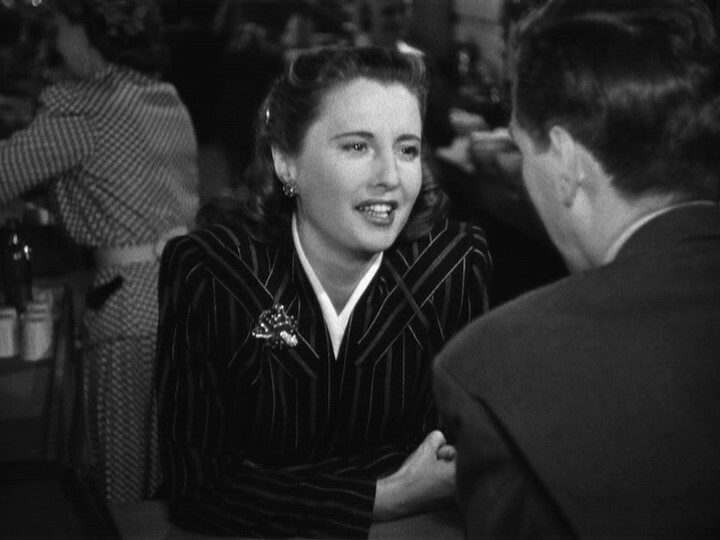 Robert Hutton speaks with Barbara Stanwyck during her cameo. -All the soldiers want to pinch S.Z. Sakall’s chubby cheeks. -John Garfield giving the history of how the Hollywood Canteen was formed. -Carmen Cavallero performing on the piano. It’s special to me because my grandmother loved Cavallero. 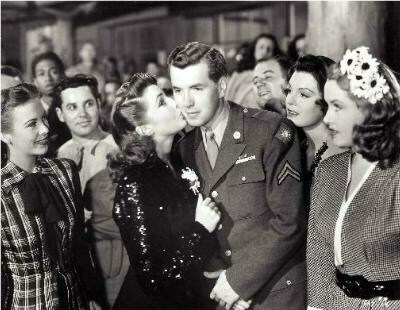 “Hollywood Canteen” is such a sweet film and you wish Joan Leslie really did have a romance and marry a soldier. Leslie was the perfect actress to play the role because she is kind and believable. Ann Sheridan was supposed to play this role but refused and I think that was beneficial for the film. Though I like Ann Sheridan, I’m not sure how she would have fit in the film. She’s not exactly warm and cuddly. 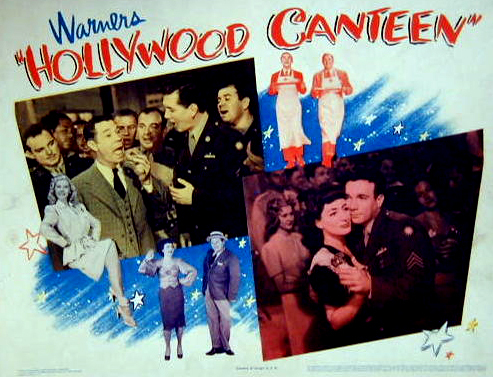 “Hollywood Canteen” has an east coast counterpart film, “Stage Door Canteen.” The plots are similar: the plot is on a backdrop of star-studded cameos and musical performances. I love both “Hollywood Canteen and “Stage Door Canteen” for different reasons. When I saw them both for the first time roughly 10 years ago, I liked “Stage Door Canteen” better. I liked the plot more and found several scenes more moving. However, now I liked them equally. But they are rather different. “Stage Door” doesn’t have the Hollywood glitter and glamour that “Hollywood Canteen” has. “Stage Door Canteen” is more of a revue of Broadway star while “Hollywood Canteen” has all the earmarks of a Hollywood film. “Hollywood Canteen” also has fewer celebrity cameos and musical numbers and more plot while “Stage Door Canteen” is the opposite. Regardless, I love both films and the glimpse they allow contemporary audiences into our past.I love both of these films but for different reasons. Hollywood Canteen is fun because of all the cameos such as Barbara Stanwyck and Joan Crawford. But it’s poignant and Joan Leslie’s performance seems sincere. If you have a spare two hours, I suggest you see it. If you aren’t into the sentiment, watch it to learn more about Hollywood Canteen. This entry was posted in Musical Monday and tagged Hollywood Canteen, Memorial Day, Musical Monday, World War II by Jnpickens. Bookmark the permalink. This surprised me for a few reasons, and boy oh boy, it’s hard not to fall for all the stars on display if Hollywood beauties of the era is one’s thing. I didn’t think I’d appreciate it much when I first saw it. But it grows on you and makes for a perfect time capsule of that war era’s feel-good entertainment.